Welcome, New Residents, to the City of Belding! We are happy you've chosen to make Belding your new home. Please let us know how we can be helpful. If you are new to Belding, we have answers to many questions. 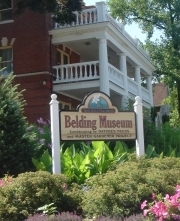 Check the Belding Bugle at the link below, and become acquainted with our city! Please let us know how we can be helpful to you, and make you comfortable in your new surroundings. Call City Hall at (616) 794-1900 with any questions, or contact us here via the website. Looking for new activities and ways to meet new friends in Belding? Check out our Event Calendar at the link below. Perhaps there is something there you might enjoy.